A fight broke out as Erdogan rushed to hear the Palestinian president’s address to the General Assembly on Friday. 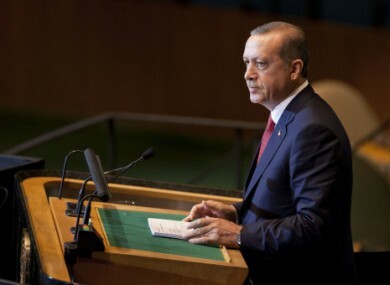 Turkish Prime Minister Recep Tayyip Erdogan speaks at the UN General Assembly last week. A SCUFFLED BETWEEN UN guards and the Turkish prime minister’s security last week has ended in an apology from the UN Secretary-General to the Turkish delegation. The ‘fight’ broke out after Recep Tayyip Erdogan rushed to enter the UN General Assembly chamber in time for the Palestinian president’s address on Friday. According to officials, Erdogan’s guards attempted to get him through a restricted entrance, which was blocked by UN guards. A shoving match ensued which lasted several minutes and spread down the stairs and onto the next floor. One of the UN guards was reportedly hospitalised with bruised ribs. According to the New York Times, Erdogan demanded an apology from the UN, which Ban Ki-Moon swiftly provided. The Turkish delegation has declined to discuss the incident. The UN has confirmed that an “unfortunate misunderstanding” occurred on Friday, but did not provide details on the incident. A spokesperson said the situation has been “satisfactorily resolved”. Email “UN apologises over scuffle with Turkish PM's security”. Feedback on “UN apologises over scuffle with Turkish PM's security”.